Early Sunday morning I found myself deep in NWÂ Portland, with my bike.Â I had no set schedule, and no required route, which gave me the chance to just ride in any direction that seemed interesting.Â Soon I found myself at the Union Station train-yards where I discovered the Union Station pedestrian bridge.Â Nice looking bridge, going over the tracks.Â But for what purpose I wondered. There is a nice elevator at each side, but I was a little surprised that for a newer Portland bridge, it really didn’t have any bicycle friendly access.Â Other than the elevators. I took the elevator. 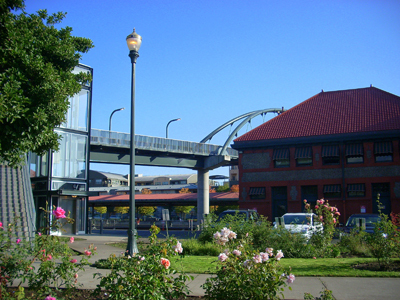 A very similar design to the Springwater trail bridge over McLoughlin Blvd. 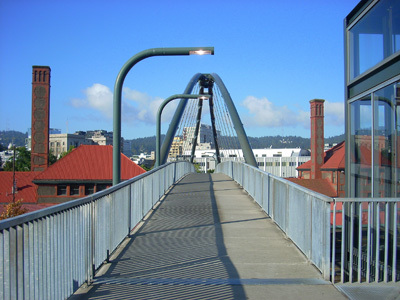 Apparently, this bridge was built to get people from the train yard area, over the tracks, and into the courtyards of “The Yards” apartment complex.Â Oh, and once you get down and around all the steps of the courtyard, it will put you out on to Naito Parkway. It doesn’t seem like a real heavy traffic flow need, but perhaps I am not aware of the needs of the residents of The Pearl district. 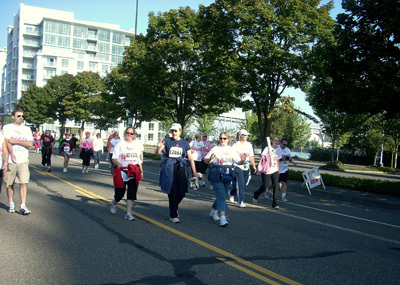 Once down to Naito I ran into The Race for the Cure in progress.Â 40,000 women walking the streets of Portland. Time to move on. 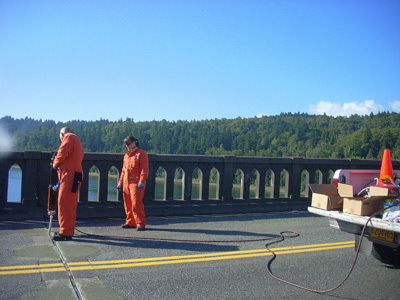 Then, on to Sellwood, to ride out onto the Sellwood bridge during another one of its regular closings.Â Last Sunday they closed it to replace the asphalt that had broken away from all the joints.Â This week they were sealing all the seams, and using their lift truck to inspect the underside. Honey thinks that one day soon they may close it for the day and just decide not to re-open it. She may be right. 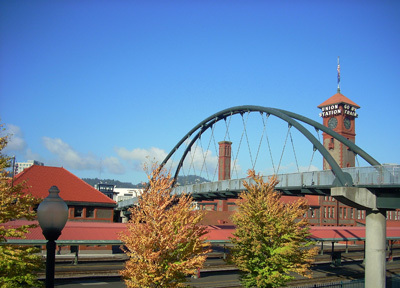 By the way, September 30, 2009 is the next open house for the Sellwood Bridge Project. 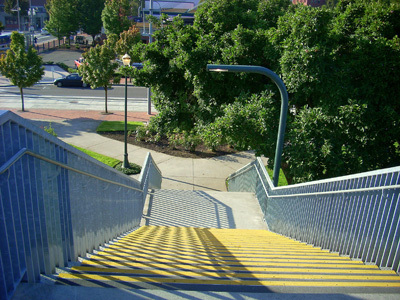 This entry was posted in Bicycling & Fitness, Portland, Or, Oregon on September 21, 2009 by golinielcomblog.